Few weeks ago we had a bottle of 1960 Vintage Port bottled by a Danish wine merchant – Fredriksberg Vinimport A/S. As you can see from the picture there was no indication of the producer on the label or anywhere else on the bottle. Since it was imported on barrel and bottled in Denmark by Fredriksberg Vinimport the cork did not reveal the secret either. The quality of the Port was really nice and it turned out to be perfectly mature and still holding a rich rather sweet bouquet of toffee and fudge. This was followed by a soft elegant taste, perhaps not as long lasting in the mouth as the best 1960 Vintage Ports but still very lovely. Do any of our Danish visitors know which house Fredriksberg Vinimport used to bottle at this time? The current owners of the Fredriksberg Vinimport Company have kindly responded that they do not have any records from that time. When it comes to the certificate on the label it is stating ‘Certificado de Origem de Vinho Do Porto. No. 11193’, we have never seen this on any Vintage Port before. What does it mean? It does not even say who has certified the wine, it is just a number. The normal way to guarantee a Vintage Port today is by using the slip label over the cork, but this seems to be something completely different. Do any of our many Portuguese visitors know what the certificate is saying? We have tried to get information about the certificate but nobody seems to know about it? Please also note that we have a page titled Help needed. Unfortunately we have not got any help at all during the years. We are sure that some of you could actually help us finding the truth about some of these questions we have. For instance we have not found any information about some of the producers we have seen and even tasted. Please check the page and see if you can help making this web site even better. 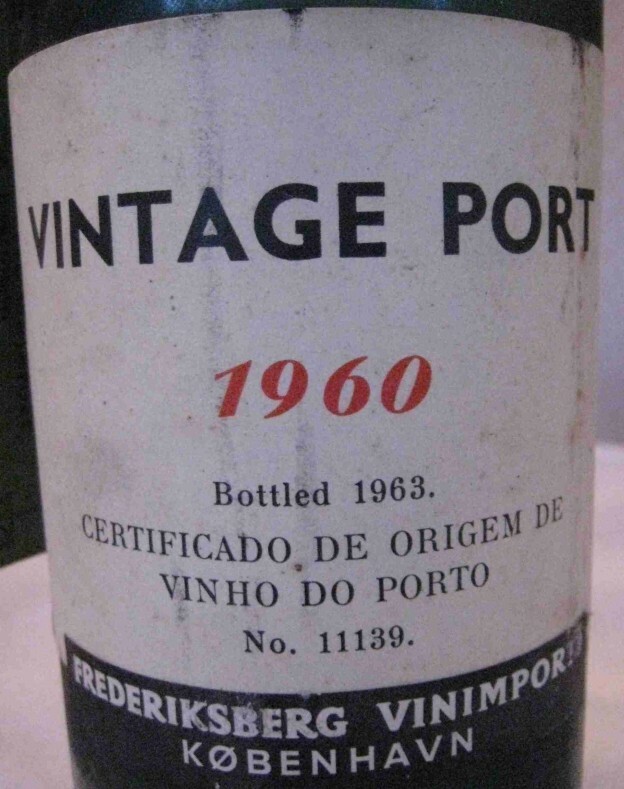 This entry was posted in Tasted Vintage Port and tagged 1960, taste, Vintage Port on February 20, 2013 by Stefan. We would like to thank you all for visiting our web site and for all supPORT. Last year was fantastic with more visitors than we could ever dream of. We had around 19.000 visitors during 2012 from 94 different countries. December is as you know a great month for drinking Port and during this month we had 3556 visitors from 67 countries with a peak at Christmas Eve with 271 visitors! On the 15th of January we reached 100 different countries visiting us and now in the end of January 107 countries have done a visit. Please continue sending suggestions so we can improve our web site. We appreciate all the positive feedback and will continue to evolve the web site with more information and more features in the future. And don’t worry; we will continue to provide all this for free! We have changed the web site so you can now add comments and answer our posts directly on the page. During summer we had a Calem from 1933 where the label told us that the vintage was from two different quintas: Quinta da Foz and Quinta Santo Antonio. Have anyone seen two different quintas on the same label before? We cannot remember seeing such a Double Quinta Vintage Port before. This entry was posted in Tasted Vintage Port, Web site stats and tagged 1933, Quinta Vintage Port, taste on February 1, 2013 by Stefan.